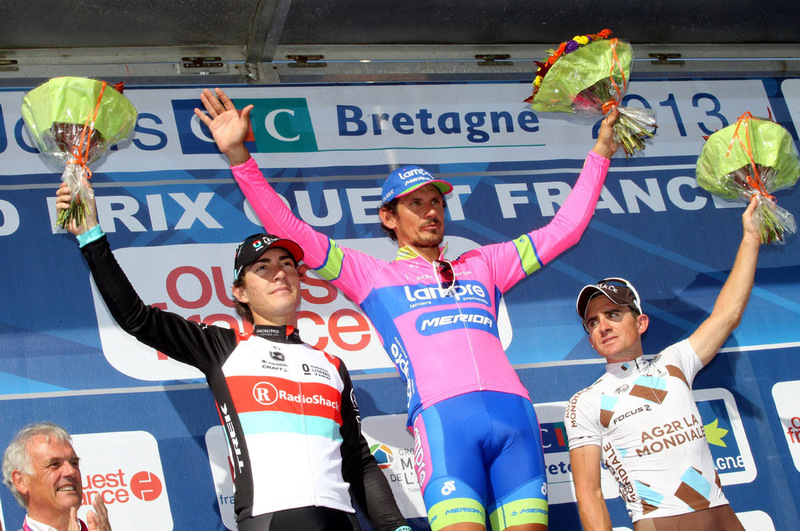 The 2013 edition of the Grand Prix Ouest-France only really came alive on the final lap after the early four-man break was caught and experienced Italian sprinter – fourth in 2007 – emerged as the winner of this Breton semi-classic. 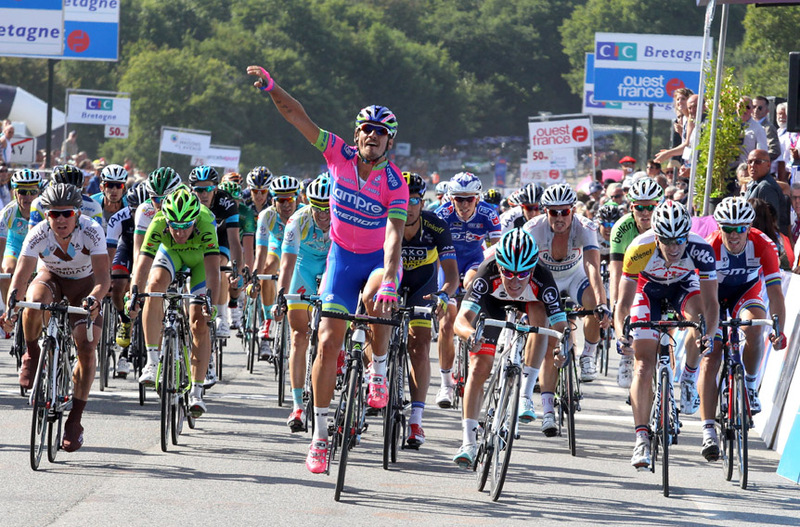 After the morning break was finally reeled in, there were a frenzy of attacks in the final 20 kilometers, but in spite of attacks on the final climb, the GP Ouest France ended in a bunch sprint, where ‘Pipo’ Pozzato gave Lampre its first decent win in… ages. The break of the day comprised four riders all Frenchman and, happily for the locals, one was from the regional team, Bretagne – Seche Environment. Natnael Berhane (Europcar), Julien Fouchard (Cofidis), Christophe Laborie (Sojasun) and Vegard Laengen, ironically, actually a Norwegian riding for the Brittany-based team. The quartet built a maximum lead of over 15 minutes as the crowd started to whistle and heckle the slumbering bunch, riding at Sportive pace. Halfway through the race – 125 kilometres – they still had a lead of over 12 minutes. But when the peloton started to chase, under the impetus of the Omega Pharma, the break’s lead tumbled. With 100km to go, the lead was nine minutes, one 27km lap later, it was down to six and it was clear that they were never going to make it to the line. With a little more than 30 kilometers to go, the leaders were caught and the attacks started. One move which stuck – albeit not for that long – comprised in-form Tom Dumoulin of Argos Shimano and Dries Devenyns (Omega Pharma) who were clear with 19km to the line, but they still had to cope with the final slog to the line up the Ty-Marrec climb and, when Dumoulin sat on – riding for the team’s sprinter John Degenkolb – the pair were caught and another break went. This time there were three riders Giovanni Visconti (Movistar), Kristijan Koren (Cannondale) and Tim Wellens (Lotto) and with 10km it was BMC who came to the front, with Taylor Phinney riding, it was presumed, for Thor Hushovd. As if scripted, the breakaway trio was caught as what was left of the peloton hit the lower slopes of the Ty-Marrec climb for the last time before the short descent to the finish line. The attacks came thick and fast. First to go was Michael Kwiatkowski (Omega Pharma) who was joined by Greg Van Avermaet (BMC) and John Degenkolb (Argos Shimano), who were in turn joined by Daniel Oss (BMC), Enrico Gasparotto (Astana) and Bjorn Leukemanns (Vacansoleil). Gasparotto attacked with 3km as the break started to stall and, although he had a gap, he was caught and the break came apart. Next to go was BMC’s Belgian Van Avermaet who jumped to create a small gap with two kilometres to the line. In the charge down to the finish Van Avermaet made it to less than one kilometer to go before he was enveloped and and ‘bunch’ sprint ensued. It looked like young Italian Giacomo Nizzolo of RadioShack had it in the bag till his older compatriot Filippo Pozzato (Lampre) did him on the line, coming from a long way back. “It was a tricky sprint and I was a bit lucky because a gap opened up at the right moment for me,” said the 32-year-old Italian. All five of the British riders on the start line did not finish the race.